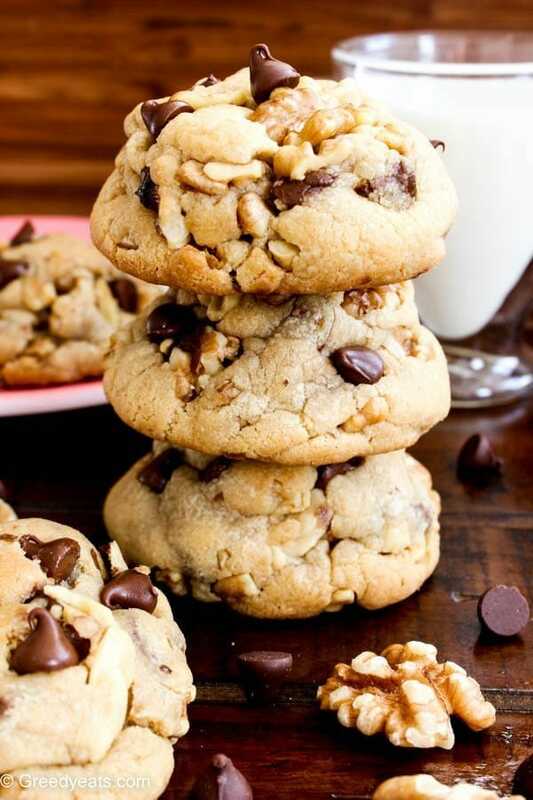 Ultra thick and so darn soft on the inside these chocolate chip walnut cookies are loaded with melty chocolate chunks and toasty walnuts in every bite! Disclosure: I am working with California Valley Nuts to bring you today’s recipe. Because, it’s weekend and we all deserve a cookie! A huge one. And certainly these are some of the best chocolate chip cookies I have made in a while…. Meet my new favorite morning obsession! Big and fat whole wheat chocolate walnut breakfast muffins. These are light as a cupcake and tall as a muffin. Just what you want! Wholesome, easy to make, chewy and flavor packed Trail mix Baked Granola Recipe that lies on my kitchen counter, computer desk, coffee table, and on my couch’s arm! Buttery, filling, healthy and easy banana bread muffins that wait to sit on your breakfast plate. Muffin treat just got way more delightful than it ever was! I have a special treat for you today. A treat you can gobble up guilt free any time of the day. Health food is never allowed to taste healthy, is it? Also, there is no pleasure in biting into a muffin that’s healthy but tastes like cardboard. This easy banana bread muffin recipe is a far cry from dry, dense and heavy(All things that some healthy muffin usually is). They are so flavorful and hearty that you can never guess these are whole wheat or lack any of the white poison sugar. Say Hello to your health and guilt-free munching with these yumm spelling, soft, gooey and chewy (my all time favorite) Granola Bars. I am absolutely amazed how a little snack bar can contain so many wholesome (no scratch that, only wholesome) ingredients. Ingredients that energize you for a long time, come together in minutes and still taste heaven. The recipe here is a sure shot winner when it comes to adding nutrition to your snacks. Now why do I call these bars healthy? Coz they contain no butter, processed sugars like high fructose corn syrup or flour. Also the ingredient list is pretty simpler and readable than market bought bars.